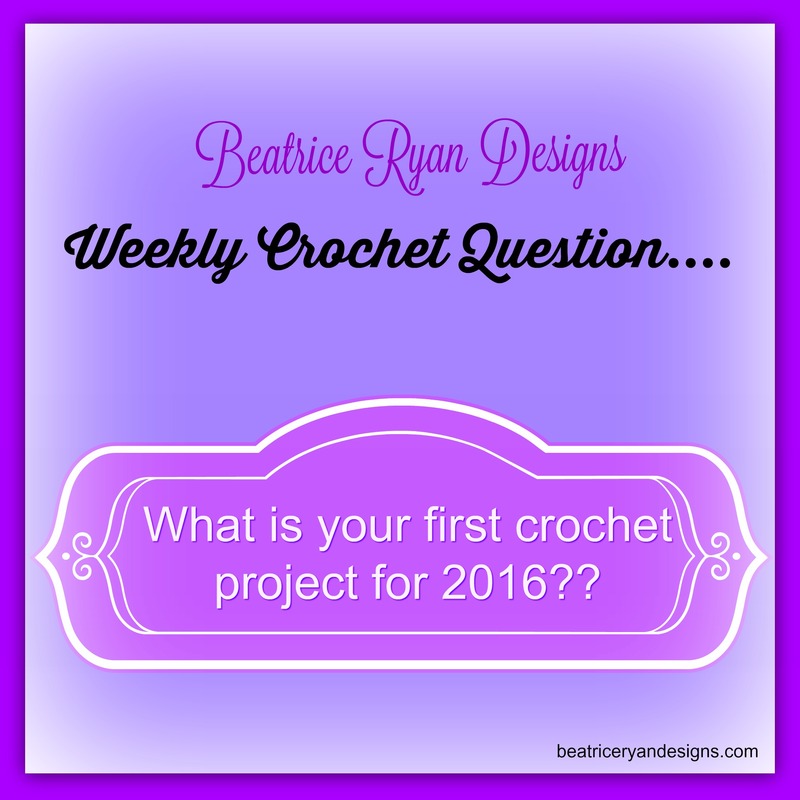 Beatrice Ryan Designs… Weekly Crochet Question!! Leave your answer in the comments… I love to hear from my crochet friends!! Making 12×12 grannies square for a queen size bed. Finishing a couple of scarves that I started in 2015! Just finished my third baby dash blanket this morning! Working on a shawl and an afghan. I’m excited about making a pair of boot cuffs as my first project of 2016. I bought the yarn yesterday _ so fun. ? Right at the moment, I need to make myself another round dishcloth. A cute hat and scarf combo for my 10-year-old niece’s birthday later in January. She lives up north and asked for thick and warm scarf. Can you recommend a specific pattern? I thinking maybe your Lady’s Whimsical Beanie pattern? My suggestion is to hop over to Ravelry or I know Moogly has some sets she has made called Ups and Downs that she made for her daughter. I just finished an 18 inches doll crochet nightgown and I am going to start a scarf and hat for my son. One of my granddaughters ask me to make her angels for her tree. I have completed 4 except for the starching. I intend on making 12, one of which will be a lg tree top angel. My granddaughter in law wants a peppermint swrill afghan. Another project for me. It was a 6 block version of the RH January Throw from their 12 months of throws. The Snowflake. Finishing a shawl for my sister. It was supposed to be a Christmas gift but I decided I didn’t like the pattern so had to start all over. I’m much happier with the new pattern so it is going much quicker. I need to get it done soon as I want to participate in two crochet-a-longs this year. I made my little black doggie a lime green coat to keep her warm. I’m working on two Temperature afghans, finishing up a baby chevron afghan, and am going to make another baby afghan using the Spiral Granny Square pattern. Busy, busy, busy. I made a scarf with pockets and now I’m working on a pair of boot cuffs. I’ve already made one pair and I love them and want more. Isn’t it wonderful to just be able to make what you want !?! Can’t wait for the CAL to start. Think I’ll get in on that too. Dresses for twin girls, a cowl that was to be a Christmas gift, and a couple more baby turbans for one of the most beautiful baby’s God created. Yes.. That is a beautiful project…. She is a wonderful designer!!! Two at a time is a great way to keep busy!!! Working on a Lego blanket for son that I started in 2015…….seems like I will never finish it…. I’m going to crochet a sock monkey for my sister-n-law. She mentioned last year that her mom gave hers to Goodwill when she went to college. I thought this would be a cute gift for her birthday in May. I’m working on a afghan right now. And then I’m going to make some hats and scarfs. Then I’m going to make a little bit of everything. I’m finishing up Christmas gifts (hats, scarves, cowls, ponchos, pouch, baby blanket, booties) for everyone haven’t seen/given to yet. My daughters birthday is on Friday so have to finish her pouch & hats also. So many projects so little time. I am going to finish off a tooth fairy doll for one of my granddaughters. Also my grandson was upset that the 4 grand-daughters got mermaid tails at Christmas but he did not so I am going to make him one. I am working on a cowl and fingerless glove set! I am crocheting a lapghan for a local hospice. This will be the second lapghan I donate to them and it feels good to start the year off doing a project for someone in need of comfort. I will be starting a crocheted temperature blanket for 2016, and am finishing up some toddler owl hats. Can’t wait! I’m starting a cotton shopping/grocery bag. A Florida Gator sweater for my great niece. I actually just finished my 1st crochet item for 2016. A scarf from a pattern by LittleMonkeysCrochet called the Macchioto Cowl using Scarfie yarn for my great-daughter-in-law. And even tho. I have about 4 WIPs, I have a shrug pattern that I want to start pronto so I can use it this winter. It is from “The Cuffed Shawl and More” by Leisure Arts and the one on the cover using Tweed Stripes from Lion Brand yarn. Finishing WIPs from 2015 BEFORE starting ANY new crochet projects. Then a prayer shawl for a friend. Doing a afghan with the Destany’s Victorian Lattice Square. I’m loving it! New (first) great-grandbaby due in June. Little Girl. So, what else would I make other than new baby knit and crochet items! I am working simultaneously on three lightweight baby afghans, booties, hats, sweaters. And toys! For the past few years, the first thing I start and finish on New Year’s Day is a hat to be donated to Halos of Hope. I think starting the year with a charity project puts me in a great mindframe for the rest of the year. I decided to try my hand at a mood afghan. Next step, I chose a star pattern, like the spider web afghan I made my grandniece for Christmas. Not sure how I’ll break it down as it gets larger, but I’m looking forward to the finished product. I also need to make another beret for my handyman. I made him one and told him it was my practice project to see what needed to be tweaked. He told me that it got wet and then it shrunk. I knew it needed some tweaks, so I’ll try my hand at a new one.